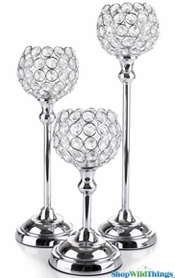 Home > Lighting > Candle Holders > Candelabra > Crystal Candelabra "Kendall" Beaded Table Chandelier 14 1/2"
Crystal elegance abounds in our new "Kendall" Crystal Beaded Candelabra with a fancy cut crystal prism stem, full of gorgeous faceted spheres that sparkle with exceptional clarity! Even the 4 1/2" in diameter base features faceted edges. 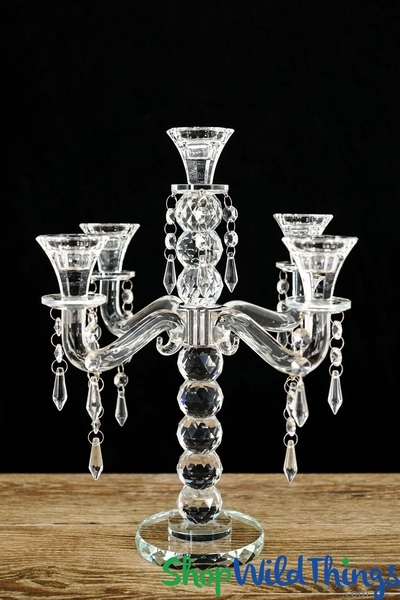 Crisp and flawless, this candelabra almost looks liquid! Real crystal is magnificent on its own but the angular cuts on Kendall create a truly extraordinary vision - the perfect centerpiece for weddings, anniversaries, special events or for bringing luxury to your everyday world! 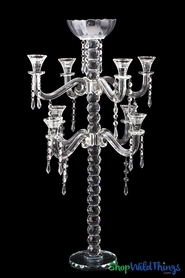 This candelabra stands 14 1/2" tall and is 13" wide. There is a beveled cup atop the center stem as well as on each of the 4 arms. All cups can hold either a 3/4" wide taper candle OR a 1 1/2" wide votive candle. This versatility makes it easy to change up the look and if using a taper candle, you could add some color by sprinkling colorful diamond confetti around the candle. Another great feature is that there are 16-3" long crystal beaded pendant strands which you can optionally hang from the bottom of the cups and arms. 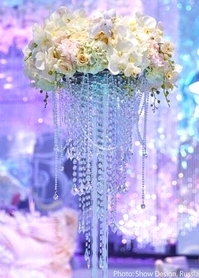 Quality and precision cuts make Kendall a centerpiece that promises to make your event remarkable and extra special! Add height and interest by combining with our other triangular prism cut crystal beauties like Muret, Catania, Bergamo, Bella, Allesandr and Prati. Together, these pieces create an incredible centerpiece display or use to highlight a dessert or gift table! For a truly magical display, place Kendall on our remote controlled Color Changing LED Light Base or our LED Square White Vase Light . This candelabra weighs 5 1/2 lbs. and is packaged very securely meaning easy transportation and safe storage! 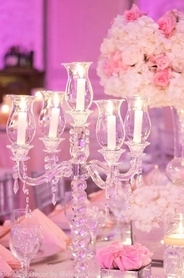 The video below shows our beautiful "Muret" Candelabra, which is a different style but made just like this one. The video will show the quality and beauty of this item! Very beautiful would buy it again. ProsThe product is what it is suppose to be and very elegant.